A Brooklyn, N.Y., man who was wrongly convicted and spent nearly 25 years in prison is now seeking damages: $1 million for every year he spent behind bars. Derrick Deacon, who was convicted for the 1989 murder of 16-year-old Anthony Wynn, has slammed New York state with a $25 million lawsuit. 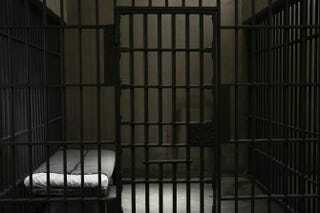 He hopes it will teach law enforcement a lesson about how not to push for a conviction, the New York Post reports. “These people have to pay for every day they made me suffer behind the wall for no reason,” the 58-year-old told the Post. Deacon was finally freed last year after being granted a new trial in June 2012. The second trial took place after a Jamaican gangbanger admitted that another gang member killed the teenager. Even more damning to the prosecution, Colleen Campbell, a woman who originally testified against Deacon, recanted, saying that investigators threatened to take away her children if she did not testify as the authorities had coached her. Deacon hopes to use the money he may receive to help his family—or those still alive. As he reflected to the news site, many of his relatives, including his mother, died while he was imprisoned. “I got kids, grandkids I want to send to college because I never had the opportunity to do that for my children. I have friends behind the wall still suffering, and I’d like to help them, too,” he said.